I’m a writer (or like to think of myself as one), a computer programmer, game designer, humorist (of dubious quality), musician (even more dubious), and generally interested in almost everything. I would say I’m a Jack of All Trades, except I’m not quite sure I rate a Jack… I’m more like the 8 of Diamonds of All Trades perhaps. I have successfully completed NaNoWriMo six times, and have attempted (and failed) the July version twice. I am also an olympic-class waffler, and I have two Silver Medals in Procrastination (I keep meaning to go for the Gold, but I never seem to get around to it). My stories have been published in 404 Ink, The Nassau Review, and several anthologies. 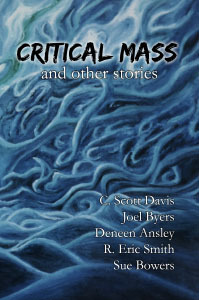 My first novel, Critical Mass, is available now (paperpack and eBook).